Apple has released iOS 11.3 for iPhone and iPad. The final version of iOS 11.3 includes multiple bug fixes, performance improvements, and several new features. Separately, Apple has released tvOS 11.3 for Apple TV, and watchOS 4.3 for Apple Watch. HomePod also has a 2GB software update available for the speaker system. For Mac users, macOS High Sierra 10.13.4 is available along with Security Update 2018-02 for earlier system software builds. 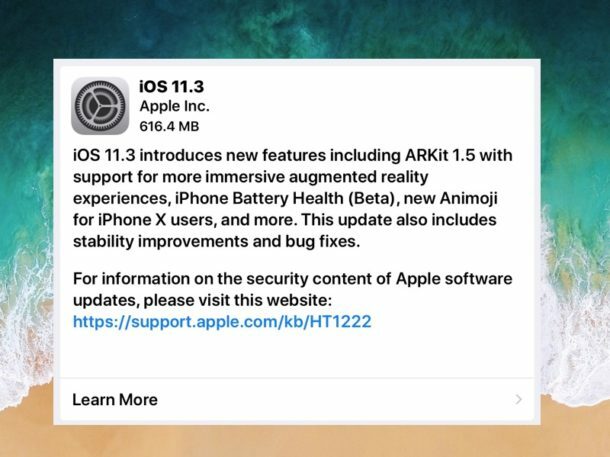 iOS 11.3 includes bug fixes and enhancements for iPhone and iPad, along with four new Animoji icons for iPhone X, a new Battery Health feature in the Settings app, along with small updates to various default apps like Health. 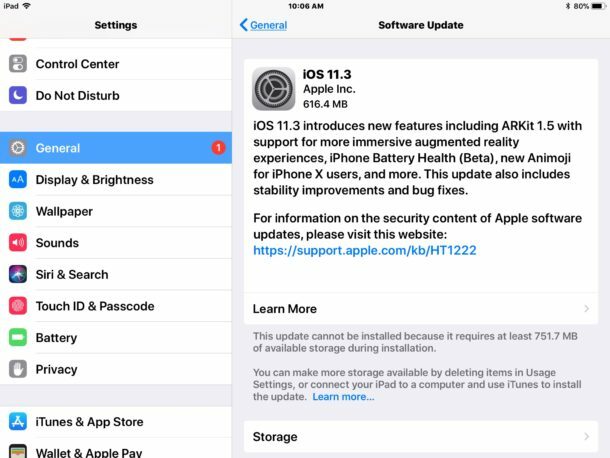 The easiest way to download and install iOS 11.3 is through the Settings app Software Update mechanism of iOS. Be sure to back up your iPhone or iPad to iCloud or iTunes (or both) before installing any software update. Users can also install iOS 11.3 through iTunes and a computer, or by using IPSW files, but either of those requires a computer and a USB cable. For users who like to use IPSW to install iOS software updates, the links below point to IPSW files hosted on Apple servers. For best results, right-click and choose “Save As” and be sur the file has an .ipsw file extension. Using IPSW is generally considered advanced and unnecessary for most users to engage in, though it is not particularly complex. Separately, watchOS 4.3 and tvOS 11.3 are also available to download and install for Apple Watch and Apple TV, respectively. WatchOS 4.3 has a new Nightstand mode setting, along with updated music controls. HomePod users can find a large 2GB software update available for their HomePod speaker. Mac users will also find macOS High Sierra 10.13.4 or Security Update 2018-002 available as software updates, depending on which version of system software they are running. iMessages in iCloud is delayed again? Honestly I don’t understand the feature anyway, but they hyped it up and then don’t release it which is weird. Anyway I don’t see any major updates with this iOS 11.3 release, but I do wonder if anyone has problems with it or if it has been flawless so far? I have learned to hold back on my software updates and let other people sort out the trouble… maybe I will update this weekend when I have spare time to troubleshoot iPhone if it has a problem. the iMessages was in the 11.3 beta 6 release 15E216A. But I’m hearing it’s not in GM. The phone won’t do an OTA update. Only way to get GM is through IPSW. But not sure I should do this. iMessage for iCloud is working on iPhone, iPad, MacBook Air, and my iMac. But they did not release GM for MacOS 10.13.4 Beta V7 (17E197A). Could create a MacOS VM with the new iTunes and use that to upgrade, or just run the upgrade on the device itself, but this is only delaying the inevitable. Correction: MacOS 10.13.4 GM was just released. I”m with you Katbel, I’m on 12.6.3 also. I have capped satellite service and with four devices in the household I’d be out of data in a week with all the updates. Hopefully Apple wakes up. Only person I have seen make a point about data useage other than me. Pet hate, Apple supply an update and never show the amount of data download. its quite arrogant to assume they only have US customers and live in Silicon valley or equivalent with fibre optic speeds and unlimited packages. If only. Satellite is good, but it costs. You shouldn’t be angry at apple. You should be angry at your government that doesn’t have decent infrastructure. Since you don’t have decent internet infrastructure you are forced to use the same technology they use in Antarctica. Also if your telecom companies were not an oligopoly, you might have been able to get massive LTE datacaps like most of the world. I pay $35 for 1terabyte of blazing fast, low latency LTE! and I live in a third world country. There is a download size indicator next to the iOS 11.3 software update package in the Settings, the size varies per device, but should be between 500mb and 2GB depending on what hardware it’s being installed onto and what is the prior version. thanks for the link, i’m still using 12.6.3, but even if you update to 11.3 outside of iTunes, I believe that any device which uses iOS 11.3 will not be able to sync with iTunes 12.6.3, and thus a central store for apps would be lost. So my biggest issue (bug) was not fixed in this new iOS release. I’m referring to the bug in which my iPhone X stops responding to anything I type in (TXT, eMail, URL entry, etc.) for 7-10 seconds and then types out whatever I typed 7-10 seconds earlier, and then the cycle repeats. I thought it might be an app but I eventually verified that no particular app or app combination is causing it. I know other people have the same issue, but not everyone. So far, Apple Support has no solution that I am aware of. This is a big PIA. Interesting. Since I installed IOS11 my iPhone 6 has been ridiculously slow. Now it’s back to its old self again, after this update. Try a hard reboot of iPad. Also you can delete the Facebook app and you can delete your Facebook account.